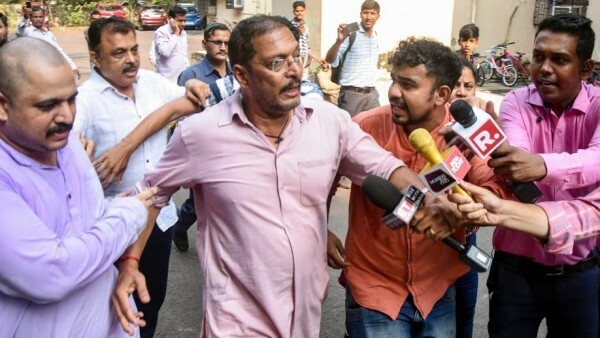 The man who provoked it all: Actor Nana Patekar running from the media. The #MeToo movement has arrived in India, and it is the media and entertainment industry that’s getting a massive shake-up. While several women are coming out with their stories on social media, a leading Bollywood production house has been dissolved following allegations of sexual assault made against one of its four partners. It all started when a few weeks ago, Bollywood actor Tanushree Dutta talked of sexual harassment at the hands of Nana Patekar, her co-star in a 2008 film. Now, the country’s news media industry, in particular, is convulsing, with at least 12 female journalists coming out with stories of harassment, often at the hands of their male colleagues. The #MeToo movement that has hit the film industry also singed the media with journalist Prashant Jha stepping down on Monday as chief of bureau and political editor of Hindustan Times and the media house looking into the allegations of sexual misconduct against him. The allegations concerning the media have surfaced over the past few days with several names, including some prominent ones, being mentioned in the social media. Journalist Sidharth Bhatia issued a statement rubbishing allegations against him. Women journalists have taken to the social media with their accounts of harassment inside and outside the newsrooms and some of them have posted snapshots of Whatsapp chats using MeToo hashtag. Dinesh Mittal, Group general counsel HT media said that a sexual harassment committee was looking into the allegations made against Jha by a former colleague. “It is proper that for fair investigation, till the time the investigation is complete, he (Jha) doesn’t have any managerial position. A sexual harassment committee with an external member is conducting a probe into the allegations against him,” Mittal said. The allegations were that Jha sent inappropriate messages on WhatsApp to the accuser. Screenshots of the conversation with Jha were also posted on Twitter. Bhatia, a founder editor of The Wire, said in his statement that he could not recall either the two women who had made the allegations or the incident they had mentioned. Several other allegations against senior journalists were made on the social media. Former DNA Editor-in-Chief Gautam Adhikari and TOI’s Hyderabad Resident Editor K.R. Sreenivas also rubbished allegations against them. Allegations have also been made against Mayank Jain of Business Standard. Meanwhile, the Network of Women in Media in India (NWMI), an organisation comprising women journalists, condemned “the rampant sexism and misogyny in Indian newsrooms” and demanded media organisations probe allegations and take appropriate actions. “All media organisations, including journalism colleges and departments, journalist unions and press clubs, must take suo moto cognisance of the accounts of survivors, institute inquiries and take appropriate action,” it said in a statement and encouraged more women to document their accounts without fear or inhibitions. It also demanded that media organisations and journalism colleges should have policies to prevent sexual harassment at the workplace and set up properly constituted internal committees. “In keeping with the Sexual Harassment Act, 2013, freelancers and stringers, who are among the most vulnerable to sexual harassment, given their job insecurity must also be brought under the purview of anti-sexual harassment policies and the jurisdiction of Internal Committees of the media houses they contribute to,” the statement said. As the Indian entertainment industry continues to grapple with the #MeToo storm, actor Nana Patekar maintained that “truth will remain the truth”, Tanmay Bhat and Gursimran Khamba of comedy collective AIB “stepped away” from their positions, and Hrithik Roshan — the star of Vikas Bahl’s “Super 30″ — said “all proven offenders must be punished” — amidst a wave of sexual harassment allegations. Nana had been avoiding the media since actress Tanushree Dutta last month renewed a 10-year-old allegation, claiming he sexually harassed her during the shoot of a 2008 film. Last week, she also filed a complaint on the same at the Oshiwara police station here. “I have no problems (in talking to the media), but when my lawyer has said so (not to talk to media), I will have to follow that,” Nana said, without taking questions from the press. In an interview in September, in the context of her opinion on the #MeToo Movement and sexual harassment of women in Bollywood, Tanushree spoke about her personal experience of facing it at the hands of Nana on the set of “Horn ‘OK’ Pleassss” in 2008. This gave a much-needed spark to India’s very own #MeToo movement, as part of which actors Rajat Kapoor, Zulfi Syed, writer Chetan Bhagat and a string of editors have been named and shamed. Trouble for All India Bakchod (AIB) arose when a volley of allegations against Chakraborty — a YouTuber who was once associated with AIB — cropped up after a woman Twitter user wrote Chakraborty had sent unsolicited pictures of private parts to women and harassed girls, including minors, through social media platforms. AIB co-founder and CEO Tanmay Bhat was called out for not acting against complaints regarding Chakraborty. On Monday, AIB in a statement said Tanmay and Gursimran have “stepped away” from the collective. “We cannot overlook Tanmay’s role and in light of this he will be stepping away from his association with AIB until further notice,” read a statement from Vidhi Jotwani, AIB’s Head of Human Resources. Tanmay will not be involved with AIB’s day-to-day functioning or in any other matter. Gursimran was accused of sexual misconduct, and has been sent “on a temporary leave until we have more clarity on the matter”, AIB said. A woman claimed that Gursimran had “hooked up two-three times, consensually and continued being friends”, but things escalated when on two separate occasions, Gursimran tried “repeatedly to make out with me while we were hanging out”. He has denied it saying he was “not forceful”. “I am sorry for my bad behaviour and all the hurt it caused her but I categorically deny any violation of consent,” he said. “It is true that I developed feelings for her while she was dating someone else. During that time, given our friendship and history, I felt rejected and was angry and did not behave appropriately at all. It had become a toxic relationship and I would like to apologise unconditionally for it like I had done in the past. That behaviour was extremely uncalled for. She rightly stopped talking to me. “We understand that disconcert of any kind adversely affects the work culture and creates an unsafe space for our employees. Nobody should have to work in an environment such as that. We hope to enable measures to establish our commitment to creating a gender-sensitive workspace. “We are in the process of consulting various experts to ensure that our work culture incorporates sensitivity, inclusivity, respect and fairness,” the statement posted on the official AIB Twitter account read.